Baxter of California Under Eye Complex is a light enriched cream specially formulated for men; firms, nourishes, and protects the sensitive skin around the eyes. Minimises puffiness and dark circles as it smoothes and tones. Marine-based elements helps reduce the signs of premature aging, while skinnourishing Bisabolol, Rose Hips Seed Oil, and Aloe Vera gel combat puffiness, soothe, and hydrate. Antioxidant Gingko Biloba shields from environmental pollution. I use this now. But I have tried some better under eye creams, and this one is kind of average on performance. It's almost empty now and I have been using it for 8 months, so thats positive. I think I will try something else next time. 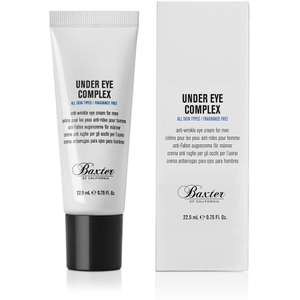 This Under Eye Complex is a good product! I recommend. Bought this eye cream as I have dark circles under my eyes. Have now been using it for nearly 2 weeks and yes there is a slight improvement but not much plus I do find it very greasy. Ignoring the previous, less than favourable reviews I was looking for a good quality, reasonably priced under eye cream so decided to give this one a try. I haven't been disappointed. Unlike the other reviewers who claim to have experienced a greasy appearance, I've had none of these issues. After applying the eye cream I tend to put moisturiser on the rest of my face and then come back to pat the remaining Baxter eye cream so it completely disappears. After about 10 minutes the cream dries to leave a soft chalky look which basically covers any dark circles really well and leaves a refreshed appearance. I've tried many under eye products and this one is by far the best. You can see a difference in just a few mins. Does not look greasy on the skin either as said by previous reviewer. Agree with the other post, has lasted me 6 months but you have to rub in well as can look greasy. Does make a difference and lasts a long time. You do not want to rub it in as you will damage the skin under your eyes. Dab the cream in.